Welcome to the homepage of Tim Van Roy. - De website van timvanroy! Welcome to the homepage of Tim Van Roy. 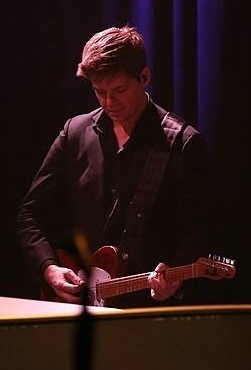 Welcome to the homepage of Tim Van Roy, guitarist (electric, acoustic and occasionally some nylon string). Check out the website for tabs, sheet music and backing tracks. Feel free to rummage through the social media sites shown below, and if you like the content make sure to "like" or "follow" to keep receiving future updates. If there is something you can't find on the page, don't hesitate to use the contact form! Tim was born in Borgerhout, Belgium, on July 20th. 1981. Most of his youth was spent in school, playing basketball, videogames and, of course, the guitar! Rather late in his highschool carreer he decided to make music his full-time occupation. After highschool he enrolled in the conservatory of Ghent, were he got his master degree in music. During his years in college he took up both the acoustic and the electric, following his leading examples Eric Johnson and Tommy Emmanuel. He also started writing for a Benelux magazine, Meet Music, with over 200 published articles as a result. After graduating, Tim started working as a guitar teacher and freelance musician with domestic and international artists. His touring schedule soon took him across Europe, playing in countries like France, Italy, Greece, Croatia, Turkey and Germany (to name but a few). He also started working as a demo artist and worked for companies like PRS, Vox, Santa Cruz and Taylor Guitars. In the meantime the urge to write his own music surfaced as well, resulting in the release of a first EP with solo acoustic work in 2008. Fast forward to the present day, where Tim's original material is becoming more and more the prime focus in his career. Two teaching methods have been released through Digital Music Publishing. "Impro(v)Course" is a method aimed at guitarist starting out in the field of improvisation, and "Note By Note" tackles one of the hardest aspects of guitar playing: sight reading sheet music (gasp!). He has also released two acoustic full albums, and is currently working on number 3. In recent years Tim has opened for acoustic greats like Tommy Emmanuel and Jacques Stotzem, and continues to do demo work for Mayson Guitars, a young brand of very exciting acoustic guitars.